If your lab waste comprises a variety of different materials, each item could then require a separate disposal option. There is also the issue of security of disposal. We can provide a full service that will mange the analysis, classification, packaging, labelling, transportation and treatment of your waste. To help you comply with the Carriage of Dangerous Goods, Classification, Packaging and Labelling regulations, we have developed specialist software for waste categorisation and labelling. 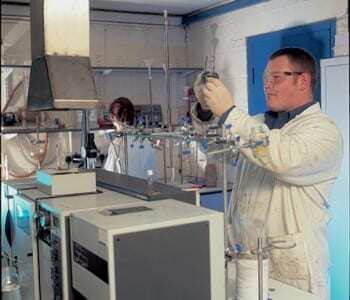 Our Technical Services team comprises qualified and fully trained chemists, working in modern laboratory suites, who can provide fast, comprehensive analysis of your waste and a proposed solution. We can also offer the services of one of our qualified Dangerous Goods Safety Advisers. We provide a total service for the disposal of small pack items. Our trained technical personnel will visit your site to prepare the waste for disposal, ensuring the correct classification and segregation for packaging and collection. All materials are transported on ADR-specified vehicles by qualified and experienced ADR drivers and all consignments are covered by a Transport Emergency Card (tremcard), which is carried in the cab of the vehicle that is transporting dangerous goods by road and contains instructions and information that the driver can refer to in the event of an incident involving the hazardous load.